The “Be sure to read this message!” scam appears inside an email, suggesting that a person put a virus on your computer and recorded you “satisfying yourself” to adult content. This is the typical scam trying to blackmail people by imposing that the cybercriminal behind it has actual leverage or access to a person’s computer. The scam is very similar to the “Hello, Perv” email message. People receiving the message are demanded to pay a ransom fee in Bitcoin (the sum being 657 dollars in this email). Do not pay the money in any case as that will not help you. See what you must do in case you are truly breached, but know that this is most likely a scam email. Short Description A scam that tries to scare you into paying a ransom fee for a supposed breach of your privacy. Symptoms You receive an email message that tries to trick you into thinking that you got recorded while masturbating. User Experience Join Our Forum to Discuss Be sure to read this message! Scam. The “Be sure to read this message!” scam is mainly distributed through e-mail messages that may even be filtered as spam by email providers by now. It could also be using targeted attacks to aim for a bigger payout by companies or rich people. Different distribution tactics may exist, too. For instance, there are mentions of the “Be sure to read this message!” scam over Facebook, and the scareware tactics and doxing may be successful there, just as well. 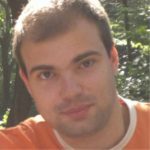 In case your computer was truly compromised, a payload file that downloads a Trojan horse or some kind of a RAT may have been trigerred by a malicious website or redirect. Freeware which is found on the Web can be presented as helpful also be hiding the malicious script for the scam message to appear. Refrain from opening files right after you have downloaded them. You should first scan them with a security tool, while also checking their size and signatures for anything that seems out of the ordinary. You should read the tips for preventing ransomware located at the corresponding forum thread. The “Be sure to read this message!” scam circling around the Internet and might have already reached social media sites such as Facebook. The message is sent over email and is a scareware tye that relies on social engineering. The extortionists want you to pay them for a supposed privacy breach that supposedly gave them access to your camera and recorded you while masturbating. Subject: Be sure to read this message! Your personal data is threatened! transfer the amount of $657 to my bitcoin address (if you do not know how to do this, write to Google: “Buy Bitcoin”). 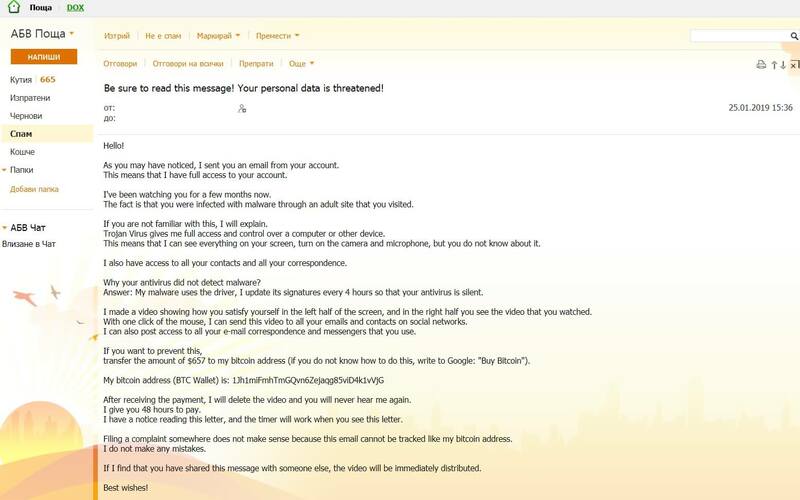 The "Hello Perv" scam appears inside an email, suggesting that a person put a virus on your computer and recorded you masturbating to adult content. There are a number of possibilities, but in most cases this is an absolute scam. You should ignore it. Do not reply to it. Do not pay the cybercriminals behind it. Change your account passwords, but first make sure your computer is clean from viruses and keylogging software. Also, check if you are changing passwords from the correct places and not from phishing pages. You are demanded to pay “657 dollars” to allegedly not spread your personal pictures and files to family and friends. However, you should NOT under any circumstances pay any ransom sum. No guarantee exists that your “data” is not going to be leaked even if you pay. This is known as doxing – an extortion involving the threat of releasing personal information, photos or videos which might be embarassing or otherwise unwanted by the person being extorted. Adding to all of this, giving money to cybercriminals will most likely motivate them to create more ransomware scams, “viruses” or commit different criminal activities. That may even result to the criminals wanting more money after payment. Be sure that even if personal details or credentials got leaked from a database breach you should not do what the extortionists ask you to do. If you have any accounts still using an old password, be certain to change those and make sure you use a different password for each account. If you can, enable two-factor authentication on the accounts. To remove the Be sure to read this message! scam you should simply delete the email message. However, if you are truly breached and you recognize any of the listed passwords, you should see the step-by-step removal instructions provided below. In case you can not get rid of files related to the scam or find out other malicious ones, you should search for and remove any leftover malware pieces with an advanced anti-malware tool. Software like that will keep your system secure in the future. Threats such as Be sure to read this message! Scam may be persistent. They tend to re-appear if not fully deleted. A malware removal tool like Combo Cleaner will help you to remove malicious programs, saving you the time and the struggle of tracking down numerous malicious files. Threats such as Be sure to read this message! Scam may be persistent on your system. They tend to re-appear if not fully deleted. A malware removal tool like SpyHunter will help you to remove malicious programs, saving you the time and the struggle of tracking down numerous malicious files. Note! Your computer system may be affected by Be sure to read this message! Scam and other threats. SpyHunter is a powerful malware removal tool designed to help users with in-depth system security analysis, detection and removal of threats such as Be sure to read this message! Scam. 1. Install SpyHunter to scan for Be sure to read this message! Scam and remove them. 2. Scan with SpyHunter, Detect and Remove Be sure to read this message! Scam. Ransomware infections and Be sure to read this message! Scam aim to encrypt your files using an encryption algorithm which may be very difficult to decrypt. This is why we have suggested several alternative methods that may help you go around direct decryption and try to restore your files. Bear in mind that these methods may not be 100% effective but may also help you a little or a lot in different situations. Note! Your computer system may be affected by Be sure to read this message! Scam or other threats. Remove Be sure to read this message! Scam by cleaning your Browser and Registry. Fix registry entries created by Be sure to read this message! Scam on your PC. Combo Cleaner is a powerful malware removal tool designed to help users with in-depth system security analysis, detection and removal of threats such as Be sure to read this message! Scam. Step 5: In the Applications menu, look for any suspicious app or an app with a name, similar or identical to Be sure to read this message! Scam. If you find it, right-click on the app and select “Move to Trash”. Step 6: Select Accounts, after which click on the Login Items preference. Your Mac will then show you a list of items that start automatically when you log in. Look for any suspicious apps identical or similar to Be sure to read this message! Scam. Check the app you want to stop from running automatically and then select on the Minus (“–“) icon to hide it. Remove Be sure to read this message! Scam – related extensions from your Mac’s browsers. A pop-up window will appear asking for confirmation to uninstall the extension. Select ‘Uninstall’ again, and the Be sure to read this message! Scam will be removed. When you are facing problems on your Mac as a result of unwanted scripts and programs such as Be sure to read this message! Scam, the recommended way of eliminating the threat is by using an anti-malware program. Combo Cleaner offers advanced security features along with other modules that will improve your Mac’s security and protect it in the future. Hey !, I found this information for you: "Remove “Be sure to read this message!” E-mail Scam". Here is the website link: https://sensorstechforum.com/remove-sure-read-message-e-mail-scam/. Thank you.